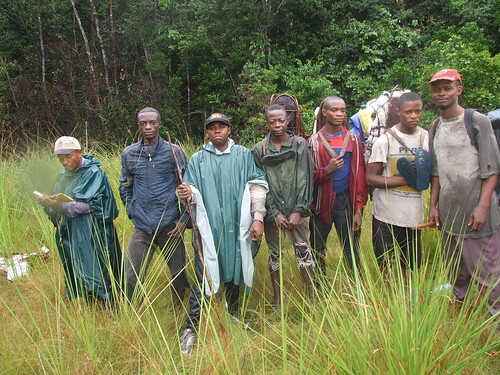 Searching for Bonobo in Congo » Hunters Pull Back from Lomami’s Bonobo Forests. 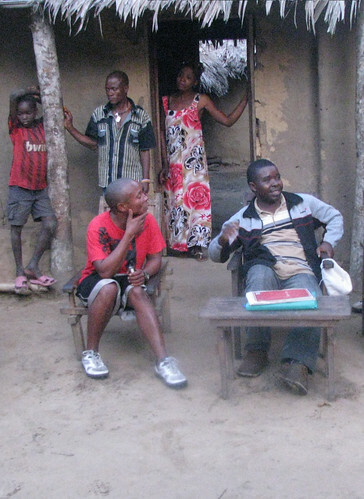 « In Congo, Diamonds are Whose Best Friend ? We are packing to return to Congo. John is filling the humming-bird feeders, here in upstate New York, one last time. The last round of clothes is scraping and sloshing through the washing machine; their next washing will be by hand under our avocado tree in Kinshasa. I am looking through the pictures that team leaders, Crispin and Maurice, transferred to John just before he left Kindu at the end of May. 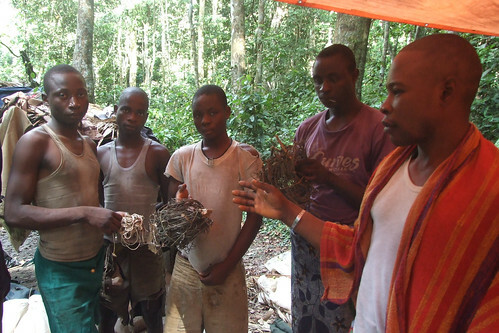 They show hunters leaving Lomami’s southern forests taking their wire snares and their shot guns. 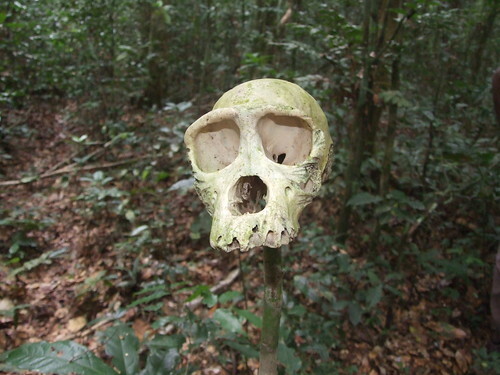 This bonobo skull was amidst the detritus left in a hunting camp, abandoned when our teams came through on their “sweep” of the forest. 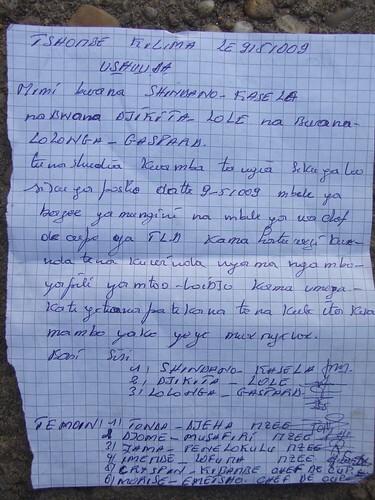 The short emails we have gotten from the middle of Congo continue to be promising. There is progress. The report from Crispin and Maurice, too, shows real progress to protect bonobo and stop over-hunting. Is this progress permanent? Can we assure it is not ephemeral? 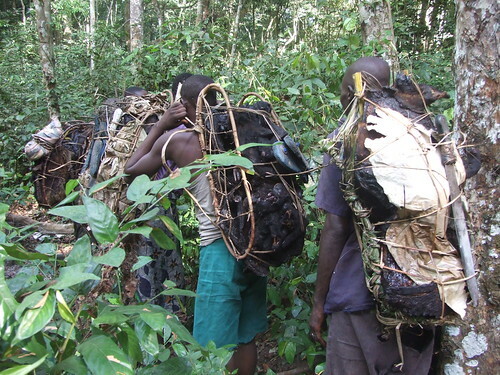 Tetela hunters leaving the Lomami Forest — hopefully for good. They are taking their bushmeat, but have signed an agreement that they will not come back. Agreement signed by the Tetela hunters, who came from another province to hunt. By this agreement they say they will not hunt anymore between the Loidjo River and the Lomami River. Crispin and Maurice hiked from hunting camp to hunting camp on the east bank of the Lomami River, in the land of the Bangengele. Their message was: there are new hunting regulations; these regulations will be enforced. Importantly, Crispin and Maurice were not alone in carrying the message. Local leaders and traditional chiefs called their people to respect the new regulations. A chief from the village of Tshombe Kilima walked the Bangengele land with Crispin and Maurice, telling “foreign” Tetela hunters to return across the Lomami to their own province. The hunters are holding snare wire and nylon cord. Honorable Bushiri is a traditional chief and an elected official. By motorbike he went from village to village informing his people that commercial hunting was mining the land of a resource that, if tended, could be the basis for tourism and a national park. Maurice is beside him in the red TL2 shirt. Perhaps not surprising, Crispin and Maurice found that remote hunting camps hide a sordid face from Congo’s recent rebellion. Here, in the far south of the TL2 landscape, as in the north, some members of the Maimai militias still take refuge. 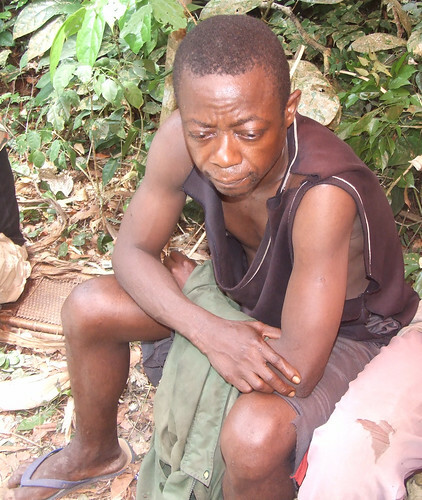 Yuda, now a bushmeat hunter, was a MaiMai rebel during the rebellion and is said to have killed more than a hundred men. As hunters they remain indefinitely on the margins of society while supplying town markets with bushmeat. The Congolese government has made efforts to “re-train” some rebels, integrating them into the army, but options for real alternatives are meager in Congo. Yuda’s wartime record makes him something of a social pariah. Temporarily, at least, we could offer him a job as a porter. We offer local hunters short-term employment, too. For them the immediate financial reward is better than hunting. But what is needed is alternative livelihoods that are long-term: when the game is hunted out, their hunting career is finished. But what is the alternative? Yuda is the porter in the middle, standing next to Crispin who is holding a walking stick and rain poncho. This entry was written by Terese Hart, posted on 2009-07-05 at 1:58 am, filed under About the project, Bonobo, Bushmeat. Bookmark the permalink. Follow any comments here with the RSS feed for this post. Post a comment or leave a trackback: Trackback URL. these are very promising news. I think especially the south of TL2 is very interesting for both tourism and diversity because here a forest landscape meets a savanna landscape(ecotone). 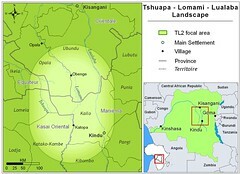 But the center of the forest in the north(Tutu west of Obenge) is also of interest. Another question. I am searching for material about orchids in DRC and i found almost nothing(only about the mountains in the east). Is the congo bassin so poorly documented or are there not many orchids? There are many ! Check the Flora of the Belgian Congo — which became “of Zaire” — now “of DRC”. It has one very large volume on orchids (Came out during the Zaire days) and it is almost certainly incomplete. Many orchids you only see when giant trees crash to the ground with their load of epiphytes. But the included savannas of south TL2 have many ground orchids. a contact: [email protected] Corneille is an excellent botanist with a keen interest in orchids. Agreed — time to work more in Province Orientale again and that is where we are heading over these next months! !